Canada won the gold medal in women's quadruple sculls on Wednesday at the Pan Am Games in Toronto. 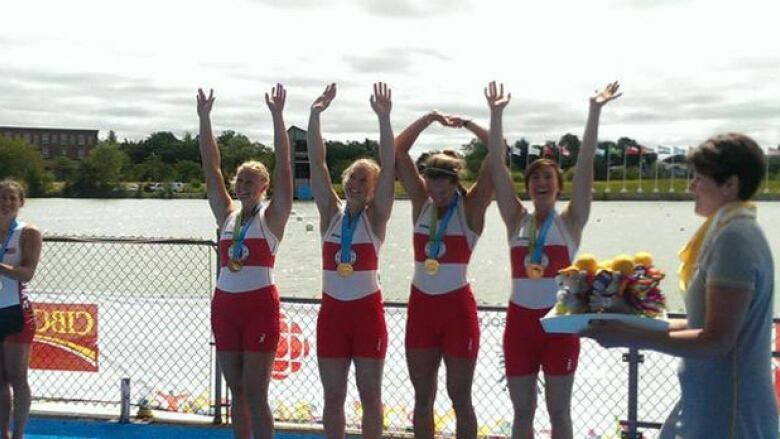 Canada won the gold medal in women's quadruple sculls on Wednesday at the Pan Am Games. Kate Goodfellow of London, Ont., Kerry Shaffer of Welland, Ont., Carling Zeeman from Cambridge, Ont. and Antje Von Seydlitz from Smithers, B.C. were almost nine seconds ahead of the rest of the field, finishing in 7:07.63 in women's quad sculls. The United States took silver in 7:16.26 and Argentina grabbed bronze in 7:18.09. Earlier, Liz Fenje finished a disappointing fifth in women's lightweight single sculls.